A bearing guided cutter to produce 3 beads of equal size in each pass. The cutter can be used to produce a decorative edge on 25mm nominal thickness boards, as well as multiple fluting on board faces for columns etc. 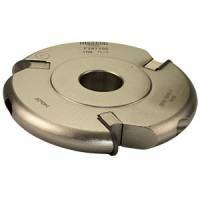 The bearing fitted to this cutter (TB625) is not designed to be removable and will leave a location spigot if removed.